Luxury B & B in a semi-rural location near to Cupar, Fife in a 200 year-old luxury stable conversion. B & B in a spacious converted stables in a peaceful and private location, Ladybank, Fife. Luxury B & B set in 590 acres of farmland, near Glenrothes, Fife. Trout fishing available by arrangement. Please see the Stay in Fife website for useful information about holidays and short-breaks in Fife. A warm welcome awaits at Ostlers Close Restaurant. Amanda and Jimmy Graham will ensure that your evening will be enjoyable, giving a personal touch to your visit. All of our menus are hand-written daily, giving our customers the best produce which is in season. The restaurant is relatively small and welcoming, so we recommend booking in advance to avoid disappointment. 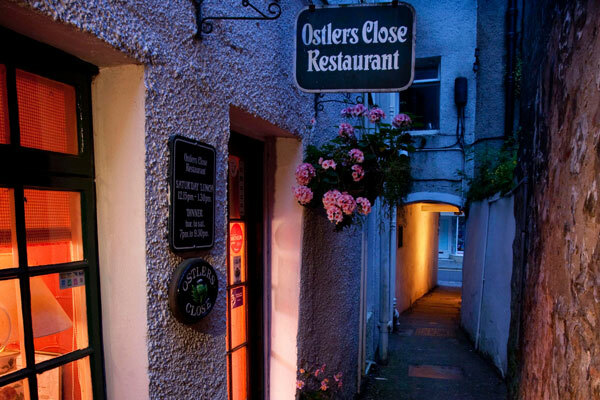 Please phone 01334 655574 or send an email to bookings@ostlersclose.co.uk. If you have any particular dietary requirements, please do not hesitate to get in touch before your visit, as we are happy to accommodate special dietary requirements such as vegetarian and gluten-free diets. For vegetarians, please see our vegetarian menu, and for gluten-free diets, we bake our own gluten-free bread daily.